Finally I’m going to begin sharing some pictures with you from the great adventure we had a couple of weeks ago. 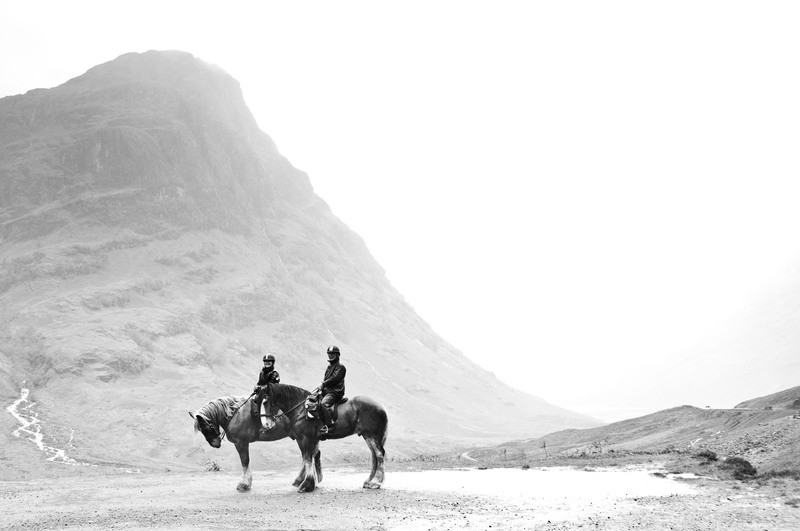 We were following these majestic horses on their ride through the highlands, retracing the route of a chase that took place 200 years ago. The chase to recover a stolen horse, tracked by way of a broken horse shoe. We may not have been able to quite emulated the sense and atmosphere of that original trek in some places, with our high visibility vests and uber-flashing magnetic sirens, when forced by necessity off the old drovers routes and onto the main arterial roads though the highlands. But it was there at other times, the quiet times, with just horses, riders, mountains flanking on all sides, dramatic and menacing skies above. In the solidity of these beautiful animals. It was there in the kindness and generosity we received a long the way. In the hospitality of strangers who found beds for us all – horses, riders, support crew – and cooked us a breakfast for Kings (and Queens with healthy appetites) each morning. It was there in the rowdy beer filled bars, in racing across Rannoch Moor to meet the horses coming the other way. It was there in the relentless rain. And in spite of the relentless rain. And watch out for more photos of it here. I’m so jealous! I want to go on fascinating adventures too. How do you do?!?! Amazing photos as always.